While lithium-ion remains the most common battery technology for solar storage applications, a number of alternatives are making themselves known. Ross McGravie reports. As hydrogen captures the attention of Australia’s chief scientist Alan Finkel, an array of emerging battery storage technologies continue to turn heads. These include the continued evolution of lithium-ion batteries, lead crystal batteries, supercapacitors, advanced compressed air energy storage, lithium ferro phosphate battery modules and various hydrogen options from one of the world’s pioneering firms. But amid the innovation, Energy & Power Supply Systems director Peter Cockburn says a three-pronged approach to training, safety and recycling is necessary to maintain trust and longevity of battery storage in households and businesses. He says the lack of a national product standard for battery storage was worrying as it currently does not deal with the assumption of planning for ‘a bad day’ in the potentially volatile environment, when extreme temperatures, thermal warming and other external factors can affect day-to-day operations. Most importantly, this would incorporate a battery management system (BMS) failure mode to stop the battery from exploding or releasing toxic gas. As part of the checks and balances, training would incorporate accreditation, installation and inspections, while a Safety Data Sheet (SDS) and access to subject matter experts would delve deeper into the capabilities of each technology. Last but not least, Peter says a recycling scheme to “take care of the cradle to the grave life cycle” – including the safe disposal of hazardous materials – was imperative for a cleaner, more environmentally friendly future. Big things are expected of A-CAES, which will be used next year (2019) at the Terramin project at Strathalbyn, SA, for load levelling, frequency response and inertia as part of the National Energy Market. Developed in partnership with AECOM, A-CAES serves as a wire-free alternative to network infrastructure development. The fuel-free storage solution “can be sited where needed to deliver hundreds of megawatts and for four hours to more than 12 hours of storage”. It provides more flexible siting options than pumped hydro or conventional CAES, and its variable capacity provides dispatchable load and generation services. The adiabatic process of A-CAES provides emission-free energy storage that also delivers synchronous generation and inertia. Its lower life-cycle costs include ability to repurpose existing site infrastructure, 30-plus years unlimited cycling, low-pressure, bankable surface equipment and a small surface footprint, making it ideal for urban applications. Total installed turnkey cost estimates range from $US1,500 to $2,500 per kW, depending on site location and system design. Compatible with existing inverters and DC electronics infrastructure, Sirius Energy Storage is a plug-and-play replacement for lead acid or lithium-ion batteries. Claimed to be the world’s first supercapacitor-based energy storage system, the 3,550Wh-capacity Sirius operates within a 44V to 54V voltage range, highlighted by a -30°C to 85°C temperature range and a 99% DC round-trip efficiency. A single solution for short, medium and long duration discharging, it enables fast charging (30 minutes) in EV, solar, backup and applications. With no risk of thermal runway or heat generation, it has a 100% depth-of-discharge in almost any location and eliminates the need for auxiliary cooling systems. The 0.75kg aluminium-cased unit has a 1,500V galvanic isolation battery management system (BMS) and an audible alarm in the event of over-charge, over discharge, over-temperature and over-current. In short, its high cycle life and high efficiency and low auxiliary operating expenses create the lowest cost of ownership and shortest payback period. Peter says Sirius is only in its early stages but it promises one million life cycles and a 10-year warranty, delivering 70Wh per kilogram at supercap cell level. It can connect a maximum number of 18 modules in series, with no limit to those connected in parallel. Cleaner, faster and environmentally safer, lead crystal batteries can be used in any application where lead acid, lead gel or AGM batteries are used. Up to 99% recyclable, they feature less acid, no cadmium and no antimony, and are classified as non-hazardous goods for air, sea and land transport. Using the positive and negative lead plates as the core electrochemical reaction area, Betta Batteries says it has developed 2V, 6V, 8V and 12V lead crystal batteries to “overcome the fundamental flaws” of batteries, such as plate sulfation, active material loss, high water loss rate, serious acid pollution, poor low-temperature performance, short life cycle and poor transport safety. The tech combines a microporous high-absorbent mat (AGM), pure lead plates and a silicon dioxide electrolyte solution that solidifies into a white crystalline powder when charged and discharged. The light-traction batteries can be discharged deeper, cycled more often (even in extreme temperatures of -40°C to 65°C) and have a longer service life for use in forklift trucks, railway systems, wind power, home solar systems, telecommunications, golf carts, wheelchairs, floor cleaners and other cleaning equipment. Each battery has a three-year factory warranty, with potential to store for two years. The design life is 18 years, with up to 6,000 charge/discharge cycles (20% DOD). Charging up to two times faster than conventional alternatives, they can be fully discharged and then restored to full-rated capacity daily. A cost-effective alternative for solar and industrial applications, lithium ferro phosphate (LFP) battery modules provide durable, lightweight (39kg) and reliable energy storage with high energy density. Operating in the same voltage window as lead acid batteries and managed with constant current/constant voltage charging, the Australian-designed-and-engineered battery module includes a BMS for increased protection and cell balancing to extend the battery life beyond its 10-year warranty. Powerplus Energy has developed a smart BMS for control of circuit protection devices, a data interface for web monitoring, a Canbus interface to third-party products, and the ability to connect multiple batteries in series to create higher voltage batteries up to 1,000V. Parallel additional batteries can be used as required. The LiFe Series includes a 120V model for direct connection to the Selectronics Inverters. Operating in a temperature range from -20°C to 60°C with an IP40 rating, the battery modules have a 60A maximum current that is limited by a circuit breaker.They have 96% to 98% charge efficiency (full recharge in less than two hours) and 10,000 cycles in off-grid solar. No project is too big or small for Norway’s Nel, which has specialised inhydrogen projects across the transport, food, petrochemical, renewable energy, polysilicon and thermal processing sectors since 1927. Encompassing production, intermediate energy storage and manufacturing of hydrogen fuelling systems, Nel provides fuel cell electric vehicles (FCEVs) with fast fuelling and long-range capabilities to rival conventional vehicles. As the world’s first UL listed and CE marked hydrogen fuelling station module, its H2 Stationis part of an ASKO zero-emission transport project to operate three Scania distribution trucks and 10 forklifts from a solar-powered production facility and fuelling station at Trondheim. 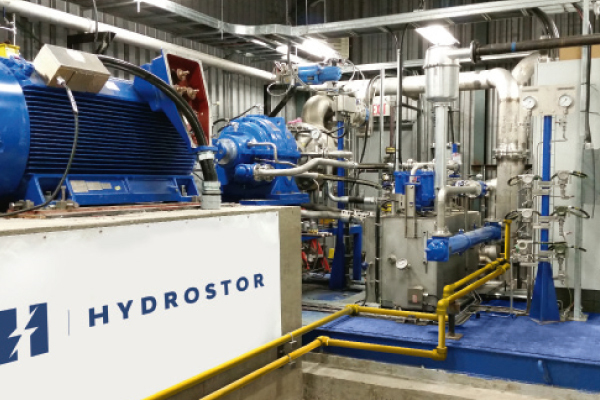 The facility produces up to 1,500kg of hydrogen energy for the AC150 containerised electrolyser, which has a daily production capacity of more than 300kg of hydrogen.